My friend Koosje Koene has been staying with us this week. Koosje is a wonderful artist and teacher so we spent a lot of time talking about drawing and sharing our sketchbooks. The weather was great so I showed her around the Village and then we sat down to draw the Jefferson Market Library. We decided to do a fun exercise— working on a single drawing together. We sat side by side with a sketchbook on our laps and worked back and forth across the spread. As you’ll hear in the video, we strategized a bit before we began, discussing how to lay out the building across both pages. Then we put our pens together and worked out from the center. Throughout, we jumped back and forth across the drawing, adding to each other’s lines, and discussing the drawing as we went. It was a blast and the whole exercise took us less than twenty minutes. Get a friend and give it a try this weekend! Every Friday I work through an idea from my latest book, Art Before Breakfast. It would be lovely if I could imagine you out there drawing along with me. This particular exercise comes from the Art Before Breakfast Workbook, to be published by Chronicle Books early next year. If you decide to do it too, please share with me how how it turned out! (Share the results on your own blog or on Facebook and post a link in my comments section. Use #artb4bkfst on Twitter or FB). PS Sorry if the video is a little noisy — we shot it on a busy morning in New York City! I usually listen to the radio while I potter around in the kitchen of a morning. Today I put on the TV instead and watched talkingheads discuss the last Republican debate. While they kvetched, I sketched. I approached it like a doodly collage, capturing moments in boxes that approximate the shape of the screen without being too slavish to reality, and augmenting them with decorative bits. I kept moving around the page, adding bits to earlier parts, making the whole thing denser and more detailed. It’s a fairly mindless way of drawing, half paying attention to the screen, half to the page. I started working in a linear way. Then I got outta the box with a blonde. This woman had fantastic hair. Part of a BMW commercial and Rachel Maddow’s hairdo. A politico with a cowlick. The Rock! For Ford trucks. Done! Time to eat some toast. One trade secret: the pause button on my remote control. I can freeze the action for a couple of minutes and catch a gesture. Other bits I just drew while they were happening or from memory. Or from my imagination. I used a manga pen and a brush pen in my trusty Stillman & Birn Delta sketchbook. Every Friday I work through an idea from my latest book, Art Before Breakfast. It would be lovely if I could imagine you out there drawing along with me. This particular exercise comes from p.51. If you decide to do it too, please share how it turned out! (Share the results on your own blog or on Facebook and post a link in my comments section. Use #artb4bkfst on Twitter or FB). 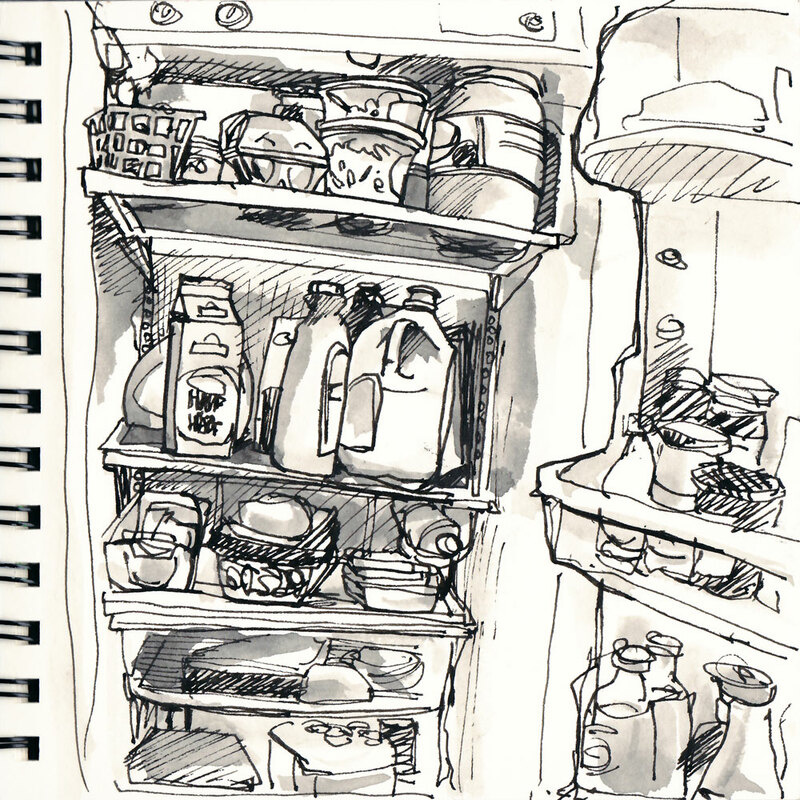 Instead of hitting the POST button at 7 am as per usual, I sat down to draw my breakfast. 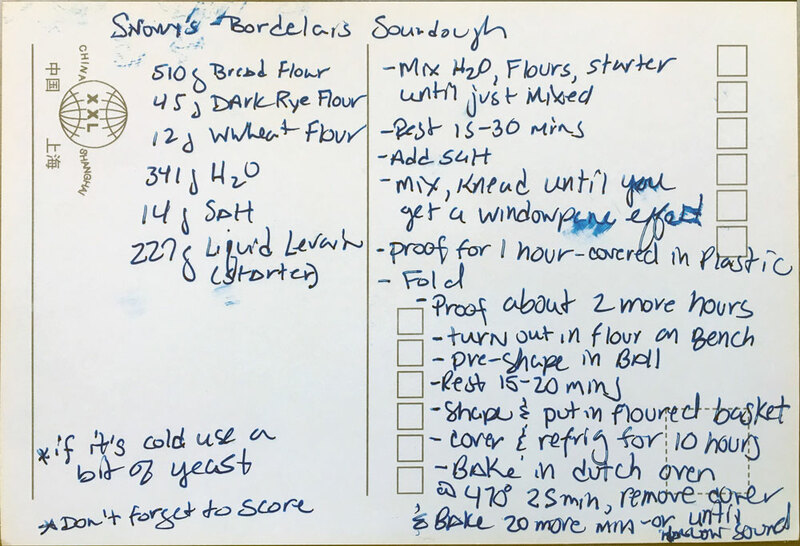 This particular slice comes from a loaf baked by our pal, Michael. He brought it to a wine tasting we hosted last weekend and it was so delicious I managed to stretch the loaf out all week. Today I hit the heel. Drawing toast is an adventure. It’s an opportunity to slow way down and delve deep. I begin by slowly driving my pen around the perimeter and then, quadrant by quadrant, I work my way through every nook, crumb, divot, pit and hole. It’s not difficult work but it’s absorbing and clears the mind. I draw the contour of the whole slice. I begin at the top. I add more details and some shading to the crust. Working further down the slice. More details, finish the crust. A title and a little note. Done! I have gone into this in more depth here on the blog, in Art Before Breakfast and in Seeing at SBS but all you really need is a pen, a piece of paper, some toast, and about 10 spare minutes. Every Friday I work through an idea from my latest book, Art Before Breakfast. It would be lovely if I could imagine you out there drawing along with me. This particular exercise comes from p.38. If you decide to do it too, please share how it turned out! (Share the results on your own blog or on Facebook and post a link in my comments section. Use #artb4bkfst on Twitter or FB). Whenever I do a drawing in indian and sumi ink, I think of Ben Katchor. For years he did comics in the Daily Forward that had a bleakness and everyday decrepitude that made a big impression in me. His weltschmerz came out in a sigh of grey washes, a shrug of indifferent lines and cramped composition. These days as he branches out to publications with bigger budgets, he uses bright colors but his work still has a lovely unsavoriness to it that smells vaguely of sour milk and unwashed socks. Okay, time to start drawing again. I made this from a photo I took at an outdoor party in the Hamptons. The bird was very impressive and the intensity of his gaze stayed with me long after he was put back in his cage. Horned owls are amazing predators and have been known to pluck out unwitting birdwatchers’ eyes, even here in New York City. For some reason, this drawing made me think of Brad Holland, an illustrator I’ve loved since I was a teen ager but haven’t referred to in years. I just went and looked at some of his work and, while I don’t think it actually does look like anything he’d do, I sort of see why it brought him to mind. 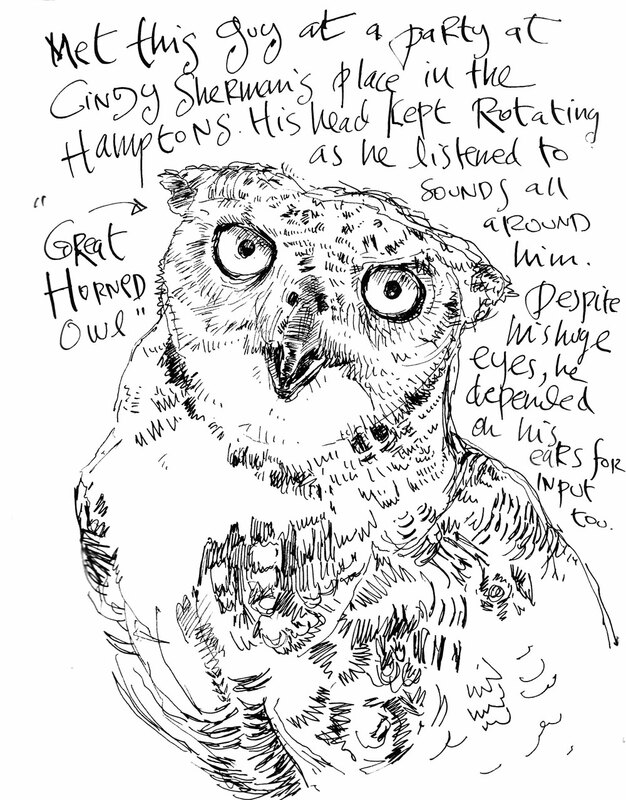 I did this drawing with my Lamy Safari in one of the new Stillman & Birn hardcover books. I love the paper though there are some issues with the binding and they suggest we wait for the next shipment before using the hardbound ones. A little macabre, I know. My approach to glass and ceramics is to pay close attention to highlights and refections. I also wanted to capture the difference in texture between the velvet lining and the glass of the eye. 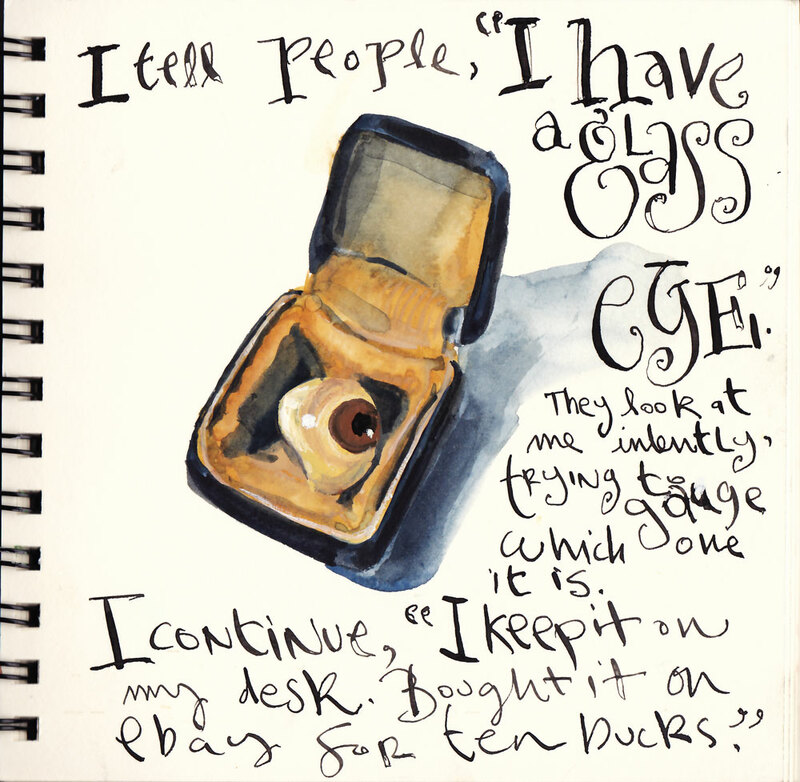 I painted the box with watercolors, using ochre and grey with a little bit of white gouache, then let it dry, and did the eyeball all in gouache. Oh, and I didn’t do any actual drawing, just used two sable brushes, #7 & 4. 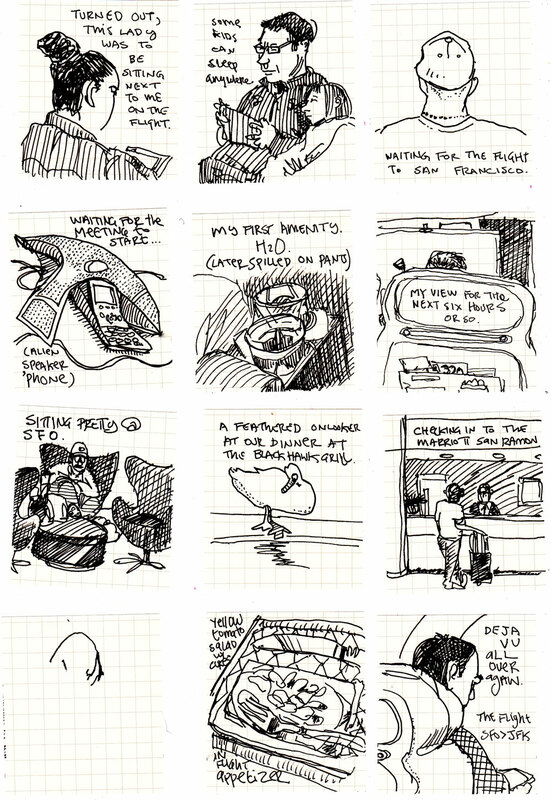 I have just returned from a busy 48 hours in San Francisco and took along a very small sketchbook, about two inches square, in which I documented my various free moments. Above are some of the pages torn out of the book. Most were drawn in a minute or two with my Lamy fountain pen (yes, I can take it when I fly as long as I don’t write with it when we are in the air. The pressure might make it explode or drip). The seventh one was interrupted by something or other. Click on the grid of drawings to open it in a separate window, then click it again to make it bigger.